Assumed investment return: 5 percent. This is a conservative assumption for long-term returns. By applying the same interest rate to both the active and indexed portfolios, the calculator isolates the impact of fees. Academic research shows that funds actively managed by stock pickers do not outperform index funds. Current total fees: 0.9 percent of assets for active stock funds. For those who, say, pay a financial adviser an annual fee of 1 percent of total investments every year, enter 1.9 percent. Low fee option: 0.14 percent for index mutual funds. Annual contribution: The total of your own (and even your employer’s) annual contribution to your 401(k), 403(b), or IRA; Squared Away assumed $0 to keep things simple. Portfolio balance, Current age, Retirement age: your choice. Research has shown that investors who pay these higher fees are unlikely to get it back in higher investment returns. But Larsen warns people to be realistic: financial products and services are not free. However, fees still are a primary consideration for retirement savers. 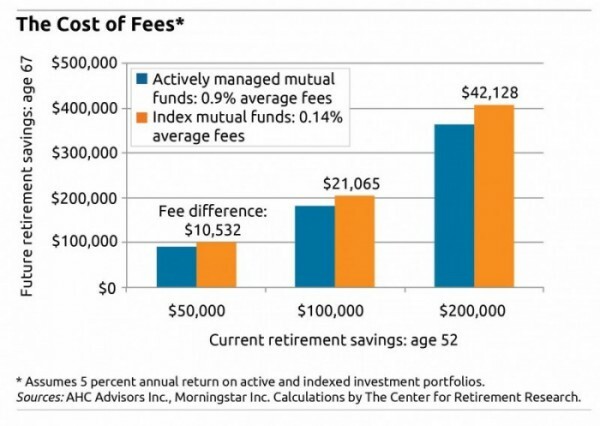 The chart, using the above assumptions, illustrates the difference in fees between a portfolio invested in actively managed mutual funds and a low-fee portfolio invested in passive index funds. Three current portfolio values were used – $50,000, $100,000, and $200,000 – for a 52-year-old on the tail end of the baby boomers who plans to retire at age 67, when he or she can collect full Social Security benefits. To test the fee calculator here, click “employee.” Make sure you’re sitting down. Wow, this is a wonderful post. Good tool. This helps people identify the lowest-cost “bad” managers. If managers have had market-like or index-like returns, then they shouldn’t be paid much. If, however, performance is much better, after fees, this won’t help compare. This is a nice presentation of accumulated information. Worthy information. It is helpful to know about how to tally the mutual fund fees. Keep sharing like this. Thanks!!! It’s great to see more information addressing the issue of fees. Even a 0.5% a year higher fee can result in huge portion of missed income over the course of a lifetime of investing. It’s not surprising banks are posting record profits (in Canada at least). Hopefully investors will go that extra mile to find a good advisor who has a low-fee.